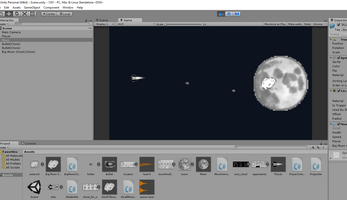 This is a very incomplete game that was made for the xkcd Game Jam, inspired by comic 1291: Shoot for the Moon. I was far busier the weekend of the jam than I had predicted when I signed up for it so a lot less development time went into it than I would have liked. What you see is the result of about 5 or 6 hours total work where I could squeeze it in. All graphics are lifted from various xkcd comics, if Randall has an issue with that he can let me know and I'll pull the game down. The single sound used in the game can be found here, as "laser4.wav". I intend to use this game as a prototype/jumping off point for making a fuller/more complete game out of this one's concept. If you are interested in following the progress of the game as it evolves and continues you will be able to do so over at Rainbow Serpent Labs.